If you are looking for a great introduction to the history of Islam, look no further. 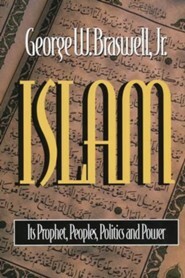 George W. Braswell Jr., former faculty member at the Faculty of Islamic Theology at the University of Teheran, has compiled a detailed introduction to Islam focusing on its: history, beliefs, social life, families, views on contemporary issues, and its views on war and peace. As Braswell sees it, there are twenty important questions to ask of or about Islam to truly understand it. They are as follows: the relationship between Christianity, Judaism and Islam at the founding of Islam; the source of Muhammad's information about biblical characters and events; why Muslims do not think that Jesus died on the cross; the rapid spread of Islam after the death of Muhammad; the greatness of the Islamic civilization during the Dark Ages in Europe; the impact of the Christian crusades on Islam; the role of violence in Islam; Islam's relationship with other religions; differences between political and religious Islam; how one becomes a Muslim; the authority of Hezbollah in Islam; political issues like theocracy, freedom of religion and separation of church and state; the role of Jerusalem in Muslim culture and history; jihad, or holy war; Islamic views on contemporary issues like abortion, sexuality, male-female relations, etc. ; Muslim greetings; legitimacy of various Muslim groups; Islamic reactions to various leaders from the Middle East; Muslims in America; the relationship of Islam in America to worldwide Islam. Islam: Its Prophet, Peoples, Politics and Power succinctly looks at all twenty major issues/questions, giving a concise and accurate picture of a growing global religion. 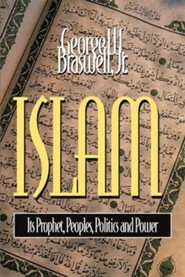 Braswell also focuses on issues between Islam and Christianity, with an eye toward greater communication between the two. The book includes an extensive glossary, and maps denoting the growth of Islam, along with a bibliography for further research. A great introduction, and a valuable asset in anyone's library. I'm the author/artist and I want to review Islam - eBook.